Both versions of this mother board are shown below. 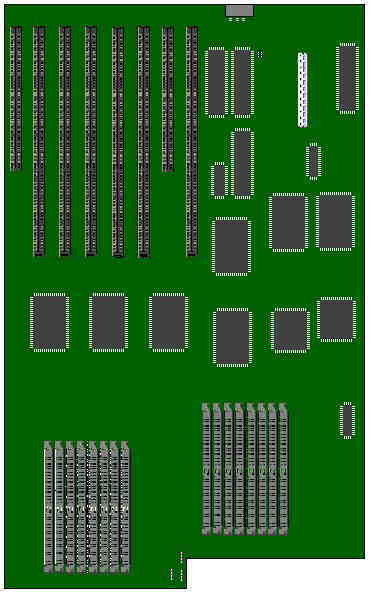 The first motherboard is the new motherboard layout (386-16 & 386-20), and the second board is the old motherboard layout (386-16). Battery : Removable, located at J2. Maths Co-Processor : This system has two variations of motherboards: A. The old variation accepts only the 80287-10 Math Co-processor at location U12. B. The new variation will accept the 80287-10, 80387DX-16 or 80387DX-20 in the appropriate Co-processor socket. JMP2 must jump 1-2 for 80387 or 5-6 for 80287. RAM : 16MB maximum. Shadow BIOS and Shadow Video takes 128Kb off Extended Memory for each enabled shadow. No jumper setting required. Use 256l or 1MB SIMMS, 70ns.